1. Lucienne Amelia Amanda Cayouette, born LIVING in Waterville, Maine, United States. She was the daughter of 2. Arthur Henry Cayouette and 3. 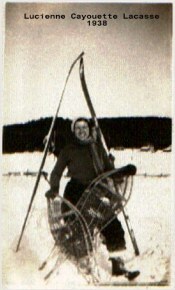 Cora Georgiana Poulin. She married (1) Ralph Edward LACASSE in Skowhegan, Somerset, Maine, United States. 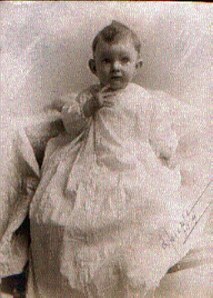 He was the son of John Lacasse and Delina Lilla Boivin. 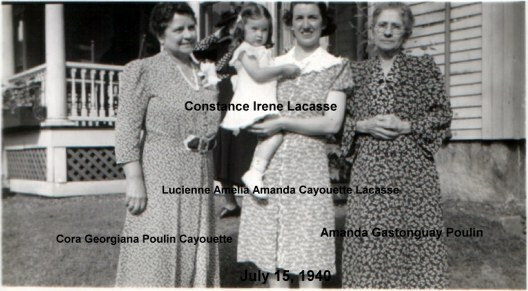 i. Constance Irene LACASSE, born LIVING in Waterville, Maine; married (1) Clyde Frederick Waite LIVING in Notre Dame De Lourdes Church, Skowhegan, Somerset, Maine, United States; married (2) Richard CRAVEN in LIVING in Skowhegan, Somerset, Maine, United States. ii. John Arthur Lacasse, born LIVING; married Susan CONROY LIVING in St Marys Church, Rutherford, New Jersey, United States. iii. Nancy Ellen Lacasse, born LIVING; married (1) James BURNS LIVING; married (2) Walter GALLANT LIVING in Bangor, Penobscot, Maine. iv. Richard Alan Lacasse, born LIVING in Skowhegan, Somerset, Maine; married Karen J ane BLAISDELL LIVING in Notre Dame Lourdes, Skowhegan, Maine United States. vi. William Olin Lacasse, born LIVING; married Lucy LEE LIVING. vii. Thomas Joseph Lacasse, born LIVING; married Laurie HARRINGTION LIVING.